Since long before the time the Delaware Indians planted their first crop of squash, the New Jersey forests have been filled with a multitude of critters. Animals like squirrels, raccoons, opossum, and even bears were a food source for Native Americans and settlers alike. These days, with urban areas almost outnumbering the wildlands, these animals have moved, quite comfortably, into many of our human habitats. Most of the time humans and these furry settlers are able to coexist. Problems ensue when the two clash, particularly when the animals decide to tear up your roof. 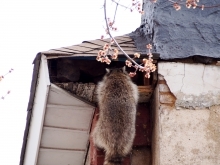 In New Jersey, there are three wild critters that will want to eat your commercial roof—raccoons, squirrels, and opossums. Of course there are always rats and mice that will try and gnaw their way into your building as well and that is why you should never leave a ham sandwich in your desk. All kidding aside, these interlopers can cause thousands of dollars worth of damage to your roof. Increasingly, the instances of wildlife damage are not as common as they once were but if it does happen, the consequences can be dire. Many times, a commercial building with a flat or low angle roof is subject to much more of what the weather can dish out then a home with a pitched roof. If the roof is not in good shape, water will pool in pockets, debris will accumulate in corners, and materials will begin to peel in the sun. All of these conditions are a doorway for these critters to gain entrance into your facility, generally through fairly large holes. When the air begins to turn cooler, the creatures try and find a warm place to hole up for the winter and hibernate—what better place than a nice warm commercial building with lots of space to hide. Squirrels, raccoons, and opossum and will chew through just about anything. There was a story (unconfirmed) once of a raccoon that chewed his way into a bank vault to get to some cheese slices that were left there by a guard. The walls were six inches of concrete surrounded by one inch steel, that’s one tough racoon and it was speculated that he was from Wisconsin. All it takes is a weakness in your roof and you could have problems with wildlife. 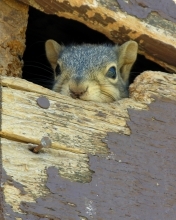 Although these crafty critters can find their way into almost anywhere, there are a few things you can do to make your commercial roof much less appealing to roof eating critters. First and foremost make sure that your roof is in good shape. The easiest way to do this is to call S&S Roofing and begin a thorough roofing inspection to shed light on the inconsistencies that may be present. The easiest way to do this, other than a comprehensive visual inspection is our proprietary infrared roof scanning. If, in fact, damage or areas that need repair are found, we can repair, replace or even reseal your commercial roof. Now is the time to get a jump on the wildlife damage and head it off before it becomes an issue. Give us a call today and we can recommend a game plan for your roof, but do us a favor and lock up your cheese slices.